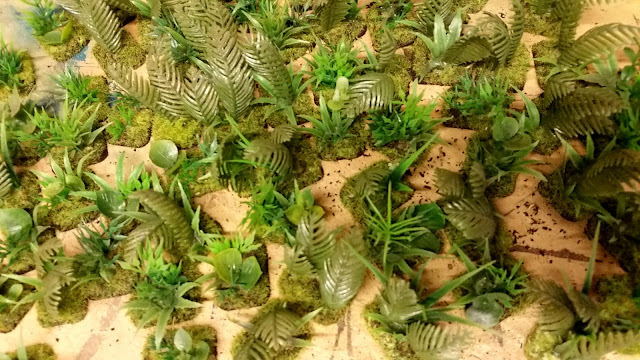 Using the method I described in the Jungle Patches and Woods article earlier this week, I made up some scatter terrain using the same bits of foliage. This time, instead of using the larger bases, I put them all on small Flames of War command bases so that I could spread them out a bit further. The concept of scatter terrain is an interesting one. Unlike normal terrain, it’s meant to represent ambient terrain, that is to say the common terrain that most tables just take for granted and not display. 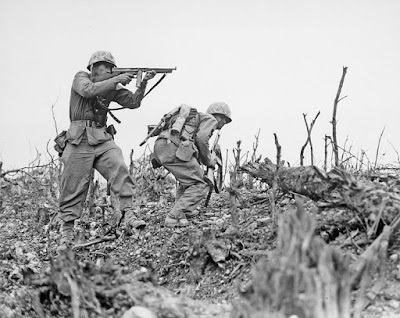 Sometimes, but not always, scatter terrain in Flames Of War is purely cosmetic and has no impact on the battlefield, such as telegraph poles, single trees, or sign posts, etc. But in the jungle, scatter terrain can be made to be more important. Furthermore scatter terrain serves an important role as a terrain amplifier. So, for my terrain collection, I decided to have a go at some scatter jungle bits. Not only can I use the Elephant Grass rules on my table, it also serves as a way to “fill out” the table in a much more realistic way, taking some of the pressure off the larger Jungle Patches, crops, and rice paddies. Often you'll see wargames tables that have a lot of open spaces, and for some games that's important (like ancients), but the tables end up looking very unrealistic with smooth flat surfaces between terrain features. The great thing about scatter terrain is that it breaks that up so that the table looks full and interesting, even if, by the rules definition, it's not. 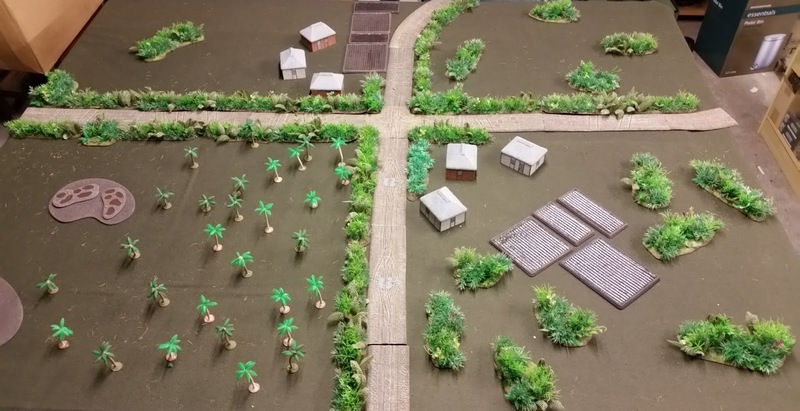 Here's a quick before-and-after of a Pacific/Vietnam battlefield first with no scatter terrain, then with some. The above uses about 75 pieces of scatter terrain, about half of what I'd like to see on there. Rather than make more of the same, I will instead make some different types of scatter terrain, including battle wreckage, sugar cane, bamboo groves, etc. Once I have more larger terrain pieces I can adjust the amount of scatter terrain up or down depending on what I'm going for. In the meantime I feel as though the table is ready for some preliminary PTO or Nam games, especially if I use the Elephant Grass rules from Flames of War: Vietnam. 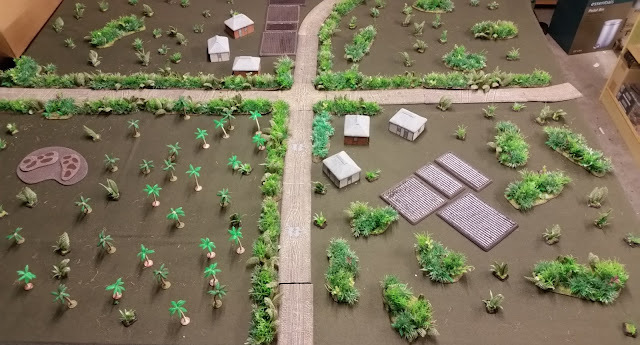 Using the Elephant Grass special rules from Vietnam, you can add some interesting flavor to your battles by checking to see if the open spaces on the table are indeed as open as you think. Roll a die and find out! So at this point you can just play the game without the scatter terrain, but after playing a lot of Nam games with elephant grass terrain markers on the table, it just adds that extra level of realism as well as serves as a very important visual reminder that that open field isn’t so open and perhaps you should put a bit more firepower over there! If you want to add further interest to your early war battles in Asia, try playing your games with the Elephant Grass rules from Tour of Duty (FW901). As a side note the FoW: Vietnam book: Brown Water Navy (FW903) has even more jungle and riverine related rules for those interested. Away from the villages, and even in gaps in the jungle, rice paddies give way to ‘elephant grass’—the soldier’s universal catchall for tall grasses. This ranges in height from knee high to well over a man’s head. The ground beneath can range from hard-packed earth to flooded and muddy depending on the season. When present, elephant grass usually covers the areas of the table that aren’t covered by other terrain. It is easiest to have the elephant grass the same height across the whole table. You can either select the height of elephant grass at the start of the game, or roll a die and use the Elephant Grass Table (an option we found added an extra challenge!) 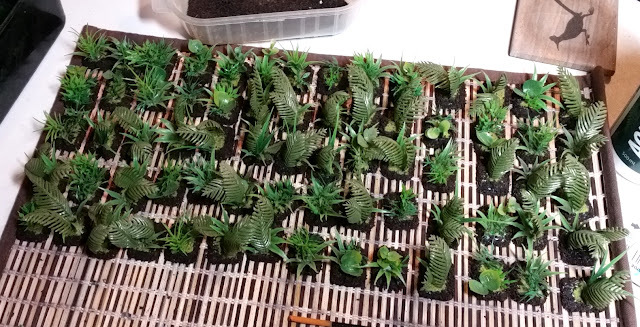 Make up some patches of elephant grass and scatter them across the table to indicate the nature of the terrain. All elephant grass is Slow Going. Knee-high grass has no effect on visibility whatsoever. Waist-high elephant grass does not limit visibility, but is Concealment for troops and guns moving on foot (although not vehicles). Head-high elephant grass allows vehicles to see and be seen, although everything is Concealed, but limits visibility to 6”/15cm between troops on the ground. Taller elephant grass hides vehicles and limits visibility to 6”/15cm like a wood.